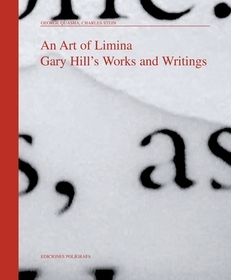 US Distributor: D.A.P./Distributed Art Publishers, Inc.
With 640 pages and more than 900 illustrations, this highly readable monograph is the most comprehensive and in-depth treatment of Gary Hill’s work to date, written in close connection with the artist, and offers an essential theoretical and scholarly frame for continuing study. Gary Hill (Santa Monica, 1951), one of the most accomplished artists of his generation, is regarded as a major contributor to new media art from the 1970s into the present. His early forays into the interconnections between language and electronic imaging and the discovery of a principle of “electronic linguistics” opened new territory in art, with implications for language art, consciousness, thinking, and extended possibilities in electronic composition. His work generates resonant philosophical and poetic insight as he explores the formal interplay of electronic visual and audio elements, often in conjunction with the physical body and with exploration of many aspects of “physicality.” With experimental rigor, conceptual precision, and imaginative leaps of discovery, Hill’s work in video is about, and itself comprises, a new form of writing. The authors, George Quasha and Charles Stein, poets/writers/artists themselves, met Gary Hill in the mid-1970s and have worked interactively and performed with him for three decades. Their long direct experience of the work enables them to reveal and analyze the main currents running through the artist’s whole career. They pay special attention, for instance, to the single-channel video work that is the foundation of Gary Hill’s better known installations. In addition to detailed discussions of the major works from the 1970s to the present, presented in a Prologue, seventeen chapters, and a long two-part conversation between the authors and the artist, there is a selection of seminal writings by the artist; a descriptive index of the 104 works discussed, including production and technical details; full bibliographical, biographical, and exhibition listings; and an index of names, titles, and concepts.